This article is about the military history of Ireland from 1641–53. For the political context of this conflict, see Confederate Ireland. Parliamentarian conquest of Ireland, defeat of the Royalists and crushing of Irish Catholic power. The war in Ireland began with the Rebellion of 1641 in Ulster in October, during which many Scots and English Protestant settlers were killed. The rebellion spread throughout the country and at Kilkenny in 1642 the Association of The Confederate Catholics of Ireland was formed to organise the Catholic war effort. 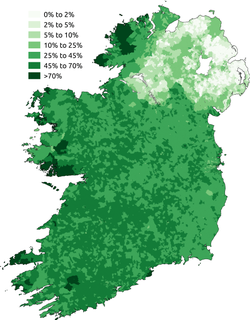 The Confederation was essentially an independent state and was a coalition of all shades of Irish Catholic society, both Gaelic and Old English. The Irish Confederates professed to side with the English Cavaliers during the ensuing civil wars, but mostly fought their own war in defence of the Catholic landed class's interests. The Irish Rebellion of 1641 began as an attempted coup d'état by Irish Catholic gentry, who tried to seize control of the English administration in Ireland to force concessions for Catholics. The coup failed and the rebellion developed into an ethnic conflict between the Gaelic Irish and old English Catholics on one side, and both ethnically English Protestants and Scottish/Presbyterian planters on the other. This began a conflict known as the Irish Confederate Wars. The Confederates ruled much of Ireland as a de facto sovereign state until 1649, and proclaimed their loyalty to Charles I. From 1642 to 1649, the Confederates fought against Scottish Covenanter and English Parliamentarian armies in Ireland. The Confederates, in the context of the English Civil War, were loosely allied with the English Royalists, but were divided over whether to send military help to them in the war there. Ultimately, they never sent troops to England, but did send an expedition to help the Scottish Royalists, sparking the Scottish Civil War. The English Civil War (1642–1651) was a series of armed conflicts and political machinations between Parliamentarians ("Roundheads") and Royalists ("Cavaliers") over, principally, the manner of England's governance. The first (1642–1646) and second (1648–1649) wars pitted the supporters of King Charles I against the supporters of the Long Parliament, while the third (1649–1651) saw fighting between supporters of King Charles II and supporters of the Rump Parliament. The war ended with the Parliamentarian victory at the Battle of Worcester on 3 September 1651. The wars produced an extremely fractured array of forces in Ireland. The Protestant forces were split into three main factions (English Royalist, English Parliamentarian and Scottish Covenanter) as a result of the civil wars in England and Scotland. The Catholic Confederates themselves split on more than one occasion over the issue of whether their first loyalty was to the Catholic religion or to King Charles I (see the principal factions in the war). The wars ended in the defeat of the Confederates. 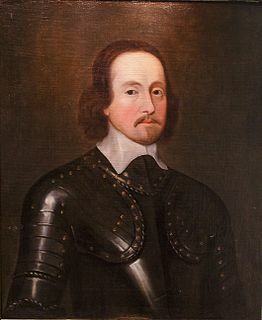 They and their English Royalist allies were defeated during the Cromwellian conquest of Ireland by the New Model Army under Oliver Cromwell in 1649–53. The wars following the 1641 revolt caused massive loss of life in Ireland, comparable in the country's history only with the Great Famine of the 1840s. The ultimate winner, the English parliament, arranged for the mass confiscation of land owned by Irish Catholics as punishment for the rebellion and to pay for the war. Although some of this land was returned after 1660 on the Restoration of the monarchy in England, the period marked the effective end of the old Catholic landed class. The New Model Army of England was formed in 1645 by the Parliamentarians in the English Civil War, and was disbanded in 1660 after the Restoration. It differed from other armies in the series of civil wars referred to as the Wars of the Three Kingdoms in that it was intended as an army liable for service anywhere in the country, rather than being tied to a single area or garrison. Its soldiers became full-time professionals, rather than part-time militia. To establish a professional officer corps, the army's leaders were prohibited from having seats in either the House of Lords or House of Commons. This was to encourage their separation from the political or religious factions among the Parliamentarians. Oliver Cromwell was an English military and political leader. He served as Lord Protector of the Commonwealth of England, Scotland, and Ireland from 1653 until his death, acting simultaneously as head of state and head of government of the new republic. The rebellion was intended to be a swift and mainly bloodless seizure of power in Ireland by a small group of conspirators led by Phelim O’Neill. Small bands of the plotter’s kin and dependents were mobilised in Dublin, Wicklow and Ulster, to take strategic buildings like Dublin Castle. Since there were only a small number of English soldiers stationed in Ireland, this had a reasonable chance of succeeding. Had it done so, the remaining English garrisons could well have surrendered, leaving Irish Catholics in a position of strength to negotiate their demands for civil reform, religious toleration and Irish self-government. However, the plot was betrayed at the last minute and as a result, the rebellion degenerated into chaotic violence. Following the outbreak of hostilities, the resentment of the native Irish Catholic population against the British Protestant settlers exploded into violence. Shortly after the outbreak of the rebellion, O'Neill issued the Proclamation of Dungannon which offered justification for the rising. He claimed that he was acting on the orders of Charles I. From 1641 to early 1642, the fighting in Ireland was characterised by small bands, raised by local lords or among local people, attacking civilians of opposing ethnic and religious groups. At first, Irish Catholic bands, particularly from Ulster, took the opportunity given them by the collapse of law and order, to settle scores with Protestant settlers who had occupied Irish land in the plantations of Ireland. Initially, the Irish Catholic gentry raised militia forces to try and contain the violence  but afterwards, when it was clear that the government in Dublin intended to punish all Catholics for the rebellion,  participated in the attacks on Protestants and fought English troops sent to put down the rebellion. In areas where British settlers were concentrated, around Cork, Dublin, Carrickfergus and Derry, they raised their own militia in self-defence and managed to hold off the rebel forces. All sides displayed extreme cruelty in this phase of the war. Around 4,000 Protestants were massacred and a further 12,000 may have died of privation after being driven from their homes. In one notorious incident, the Protestant inhabitants of Portadown were taken captive and then massacred on the bridge in the town. The settlers responded in kind, as did the Government in Dublin, with attacks on the Irish civilian population. Massacres of Catholic civilians occurred at Rathlin Island and elsewhere. The rebels from Ulster defeated a government force at Julianstown, but failed to take nearby Drogheda and were scattered when they advanced on Dublin. By early 1642, there were four main concentrations of rebel forces; in Ulster under Phelim O'Neill, in the Pale around Dublin led by Viscount Gormanstown, in the south-east, led by the Butler family – in particular Lord Mountgarret and in the south-west, led by Donagh MacCarthy, Viscount Muskerry. Forces initially available to the Confederacy were primarily militia and private levies, commanded by aristocratic amateurs like Lord Mountgarret. These suffered a series of defeats, including Liscarroll, Kilrush, New Ross and Glenmaquinn but the outbreak of the English Civil War in mid-1642 led to the recall of many English troops. This allowed Garret Barry, a returned Irish mercenary soldier, to capture Limerick in 1642, while the English garrison in Galway was forced to surrender by the townspeople in 1643. The Civil War gave the Confederates time to create regular, full-time armies and they were eventually able to support some 60,000 men in different areas. These were funded by an extensive system of taxation, equipped with supplies from France, Spain and the Papacy and led by Irish professionals like Thomas Preston and Owen Roe O'Neill, who had served in the Spanish army. The opening years of the war saw widespread displacement of civilians – both sides practising what would now be called ethnic cleansing. 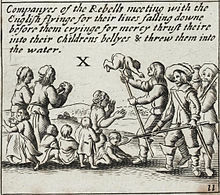 In the initial phase of the rebellion in 1641, the vulnerable Protestant settler population fled to walled towns such as Dublin, Cork and Derry for protection. Others fled to England. When Ulster was occupied by Scottish Covenanter troops in 1642, they retaliated for the attacks on settlers by attacks on the Irish Catholic civilian population. As a result, it has been estimated that up to 30,000 people fled Ulster in 1642, to live in Confederate held territory. Many of them became camp followers of Owen Roe O'Neill's Ulster Army, living in clan-based groupings called "creaghts" and driving their herds of cattle around with the army. Outside of Ulster, the treatment of civilians was less harsh, although the "no-mans-land" in between Confederate and British held territory in Leinster and Munster was repeatedly raided and burned, with the result that it too became de-populated. However, the stalemate in Ireland was broken in 1646, with the end of the first English Civil War. The Confederates, after their military ousted the Confederate Supreme Council who had signed a peace Treaty with the Royalists, abandoned further negotiations with the defeated Royalists and tried to re-take all of Ireland before the English Parliament could launch an invasion of the country. They were bolstered by the arrival in Ireland of the Papal Nuncio, Rinuccini, who brought with him large amounts of money and arms. They managed to capture a Parliamentarian stronghold at Bunratty castle in Clare and to smash the Scottish Covenanter army at the battle of Benburb and also take Sligo town. Late in the year, the Ulster and Leinster Confederate armies under Owen Roe O'Neill and Thomas Preston (a total of 18,000 men) laid siege to Dublin, trying to take the city from Ormonde’s Royalist garrison. However Ormonde had devastated the land around the capital and the Confederates, unable to supply their troops, had to lift the siege. In hindsight, this was the high tide for the Irish Confederates. Ormonde, who said that he "preferred English rebels to Irish ones", left Dublin and handed it over to a Parliamentarian army sent from England under Michael Jones. Further Parliamentarian reinforcements were sent to Cork in southern Ireland. In 1647, these Parliamentarian forces inflicted a shattering series of defeats on the Confederates, ultimately forcing them to join a Royalist coalition to try to hold off a Parliamentarian invasion. Firstly, in August 1647, when it tried to march on Dublin, Thomas Preston's Leinster army was annihilated at the battle of Dungans Hill by Jones’ Parliamentarian army. This was the best trained and best equipped Confederate army and the loss of its manpower and equipment was a body blow to the Confederation. Secondly, the Parliamentarians based in Cork devastated the Confederates' territory in Munster, provoking famine among the civilian population. In September, they stormed Cashel, not only taking the town but also massacring its garrison and inhabitants, including several Catholic clerics. When the Irish Munster army brought them to battle at Knocknanauss in November, they too were crushed. Sligo also changed hands again – captured by the Ulster British settlers' army. The battles in this phase of the war were exceptionally bloody: in the battles of 1646–47, the losers had up to half of those engaged killed – most commonly in the rout after the battle was decided. In the three largest engagements of 1647, no less than 1% of the Irish male population (around 7,000–8,000 men) were killed in battle. This string of defeats forced the Confederates to come to a deal with the Royalists, and to put their troops under their command. Amid factional fighting within their ranks over this deal, the Confederates dissolved their association in 1648 and accepted Ormonde as the commander in chief of the Royalist coalition in Ireland. Inchiquin, the Parliamentarian commander in Cork, also defected to the Royalists after the arrest of King Charles I. The Confederates were fatally divided over this compromise. Rinuccini, the Papal Nuncio, threatened to excommunicate anyone who accepted the deal. Particularly galling for him was the alliance with Inchiquin, who had massacred Catholic civilians and clergy in Munster in 1647. There was even a brief period of civil war in 1648 between Owen Roe O'Neill's Ulster Army, as he refused to accept the Royalist alliance, and the new Royalist–Confederate coalition. O'Neill neglected to secure adequate supplies and was unable to force a change in policy on his former comrades. During this divisive period the Confederates missed a second strategic chance to reorganise while their opponents were engaged in the Second English Civil War (1648–49), which was lost by their royalist allies. 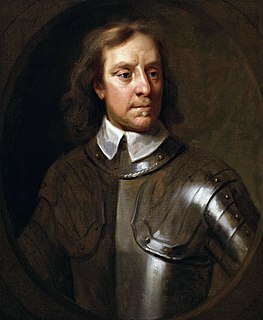 Oliver Cromwell landed in Ireland in 1649 to re-conquer the country on behalf of the English Parliament. He left in 1650, having taken eastern and southern Ireland – passing his command to Henry Ireton. The Confederate/Royalist coalition wasted valuable months fighting with Owen Roe O'Neill and other former Confederates instead of preparing to resist the impending Parliamentarian invasion of Ireland. O'Neill later re-joined the Confederate side. Belatedly, in summer 1649, Ormonde tried to take Dublin from the Parliamentarians, and was routed by Michael Jones at the battle of Rathmines. Oliver Cromwell landed shortly afterwards with the New Model Army. Whereas the Confederates had failed to defeat their enemies in eight years of fighting, Cromwell was able to succeed in three years in conquering the entire island of Ireland, because his troops were well supplied, well equipped (especially with artillery), and well trained. Moreover, he had a huge supply of men, money and logistics to fund the campaign. His first action was to secure the east coast of Ireland for supplies of men and logistics from England. To this end, he took Drogheda and Wexford, perpetrating massacres of the defenders of both towns. He also sent a force to the north to link up with the British settler army there. Those settlers who supported the Scots and Royalists were defeated by the Parliamentarians at the battle of Lisnagarvey. Ormonde signally failed to mount a military defence of southern Ireland. He based his defences upon walled towns, which Cromwell systematically took one after the other with his ample supply of siege artillery. The Irish and Royalist field armies did not hold any strategic line of defence and instead were demoralised by a constant stream of defeats and withdrawals. Only at the siege of Clonmel did Cromwell suffer significant casualties (although disease also took a very heavy toll on his men). His losses were made good by the defection of the Royalist garrison of Cork, who had been Parliamentarians up to 1648, back to the Parliament side. Cromwell returned to England in 1650, passing his command to Henry Ireton. In the north, the Parliamentarian/settler army met the Irish Ulster army at the battle of Scarrifholis and destroyed it. Ormonde was discredited and fled for France, to be replaced by Ulick Burke, Earl of Clanricarde. By 1651, the remaining Royalist/Irish forces were hemmed into an area west of the River Shannon, holding only the fortified cities of Limerick and Galway and an enclave in County Kerry, under Donagh MacCarthy, Viscount Muskerry. Ireton besieged Limerick while the northern Parliamentarian army under Charles Coote besieged Galway. Muskerry made an attempt to relieve Limerick, marching north from Kerry, and was routed by Roger Boyle at the battle of Knocknaclashy. Limerick and Galway were too well defended to be taken by storm, and were blockaded until hunger and disease forced them to surrender, Limerick in 1651, Galway in 1652. Waterford and Duncannon also surrendered in 1651. Galway; the last Irish town to fall to the Parliamentarians, in 1652. While formal resistance ended, the harsh surrender terms resulted in a period of guerrilla warfare by bands of former soldiers, known as Tóraidhe or 'Tories.' These operated from rugged areas such as the Wicklow Mountains, looting supplies and attacking Parliamentary patrols, who responded with forced evictions and the destruction of crops. The result was widespread famine, aggravated by an outbreak of bubonic plague. The last organised Irish force surrendered in Cavan in April 1653 and given passage to France to either serve in the French army or with the English Royalist Court in exile. Those captured after this point were executed or transported to penal colonies in the West Indies. The Irish Confederate wars was a complex conflict in which no less than four major armies fought in Ireland. These were the Royalists loyal to King Charles, the Scottish Covenanters (sent into Ulster in 1642 to protect Protestant planters after the massacres that marked the Irish rebellion of 1641 in that region), the Parliamentarian army, and the Irish Confederate army to whom most of the inhabitants of Ireland gave their allegiance. During the wars, all of these forces came into conflict at one stage or another. To add to the turmoil, a brief civil war was fought between Irish Confederate factions in 1648. The Royalists under Ormonde were in conflict with Irish Catholic forces from late 1641 to 1643. Their main enclave was in Dublin. A ceasefire with the Confederate Catholics lasted from 1643 until 1646, when the Confederates again came into conflict with the Royalists. After 1648 most of the Confederates and the Scots joined an alliance with the Royalists. This was the array of forces that was to face Cromwell's army in 1649. Ormonde's handling of the defence of Ireland was however rather inept so that by mid-1650 the defence of Ireland was conducted mainly by Irish Confederate leaders. The Irish Confederates: formed in October 1642, the Confederation of Kilkenny was initially a rebel Irish Catholic movement, fighting against the English troops sent to put down the rebellion, though they insisted they were at war with the king's advisers and not with Charles himself. They also had to fight the Scottish army that landed in Ulster. From 1642 to 1649, the Confederates controlled most of Ireland except for east and west Ulster, Cork city and Dublin. A cessation was arranged with the Royalists in 1643 after the outbreak of civil war in England and negotiations began to bring the Confederates into the English conflict on the Royalist side. A strongly Catholic faction under the influence of the Irish Bishops and Nuncio Rinuccini emerged in 1646, which opposed signing a peace treaty that did not recognise the position of the Catholic Church in Ireland or return confiscated Catholic land. When this faction ousted the Confederate 'peace party' or pro-Royalists, the Confederates once again clashed with the English Royalists, who abandoned most of their positions in Ireland to the Parliamentarians during 1646. However, after fresh negotiations, an alliance was arranged between the Royalists and Confederates in 1648. Some Confederates (most notably the Ulster army) were however opposed to this treaty initiating a brief Irish Catholic civil war in 1648 in which the Ulster Confederate army was supported by the English Parliament. The Scottish Covenanters arrived in Ireland in early 1642 to put down the uprising and thereby protect the lives and property of the Scottish Protestant settlers in Ulster. They held most of eastern Ulster for the duration of the war, but were badly weakened by their defeat by the Confederates at the battle of Benburb in 1646. They fought the Confederates (with the support of the English Parliament) from their arrival in Ulster in 1642 until 1648. 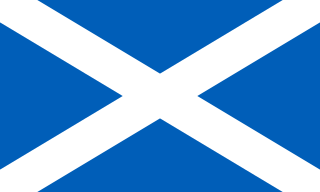 After the English Parliament and the Scottish Covenanters' alliance broke down, the Scottish forces in Ulster joined the Confederates and Royalists in an alliance against their former allies in 1649. The Parliamentarian Army gained a major foothold in Ireland for the first time in 1644, when Inchiquin's Cork-based Protestant force fell out with the Royalists over their ceasefire with the Confederates. 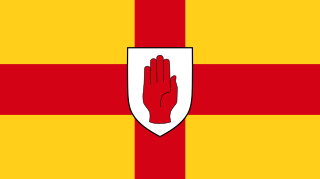 The Protestant settler forces in the north west of Ireland, known as the Lagan Army (or Lagan Force), also came over to the Parliamentarians after 1644, deeming them to be the most reliably anti-Catholic of the English forces. The city of Dublin fell into Parliamentarian hands in 1646, when the Royalists surrendered it to an English Parliamentarian expeditionary force after the city was threatened by Confederate armies. In 1648 the Parliamentarians briefly gave support to Owen Roe O'Neill's Ulstermen after his fall out with the Confederates: Thus the extreme Catholic and Puritan forces were briefly allied for mutual expediency. The Ulster Catholic army however joined the Confederate-Royalist alliance after the shock of Cromwell's invasion in August 1649. The most potent Parliamentarian force was the New Model Army, which proceeded to conquer Ireland over the next four years and to enforce the Adventurers Act by conquering and selling Irish land to pay off its financial backers. ↑ Mícheál Ó Siochrú/RTÉ ONE, Cromwell in Ireland Part 2. Broadcast 16/9/2008. ↑ "The Eleven Years War 1641-52 – A Brief Overview". theirishstory.com. 10 January 2014. Retrieved 21 March 2018. ↑ Padraig Lenihan, Confederate Catholics at War 1641–49, p33-34, "The Catholic elite of Meath dithered for a whole month between trying to rein in popular rebels and going into rebellion themselves". "Right up to the eve of the encounter at Julianstown, the local Catholic nobility and most of the gentry still backed the government"
↑ Lenihan, p23, "Bellings, the future secretary of the Confederate Catholics, claimed the Lords Justice, in response to the rebellion, showed they wanted to drive the Old English into following the example of the Ulster insurgents by their offensively wide description of the insurgents as some "evil affected Irish Papists"
↑ Manganiello, Stephen (2004). The Concise Encyclopedia of the Revolutions and Wars of England, Scotland, and Ireland, 1639-1660. Scarecrow Press. p. 160. ISBN 978-0810851009. ↑ Lenihan, Padraig (2016). Consolidating Conquest: Ireland 1603-1727 (Longman History of Ireland). Routledge. pp. 109–110. ISBN 978-1138140639. ↑ McKeiver, Philip (2008). A New History of Cromwell's Irish Campaign. Advance Press. ISBN 978-0955466304. ↑ Kenyon & Ohlmeyer, p.98. ↑ Fraser, Antonia (1973). Cromwell, Our Chief of Men, and Cromwell: the Lord Protector (Phoenix Press), ISBN 0-7538-1331-9 pp.344–46. ↑ Bottigheimer, Karl (November 1967). "English Money and Irish Land: The 'Adventurers' in the Cromwellian Settlement of Ireland". Journal of British Studies. 7 (1): 12. Lieutenant-General James FitzThomas Butler, 1st Duke of Ormond, 1st Marquess of Ormond, 12th Earl of Ormond, 5th Earl of Ossory, 4th Viscount Thurles, 1st Baron Butler of Llanthony, 1st Earl of Brecknock, KG, PC was an Irish statesman and soldier, known as Earl of Ormond from 1634 to 1642 and Marquess of Ormond from 1642 to 1661. Following the failure of the senior line of the Butler family, he was the second of the Kilcash branch to inherit the earldom. His friend, the 1st Earl of Strafford, caused him to be appointed the commander of the Cavalier forces in Ireland. From 1641 to 1647, he led the Royal Irish Army fighting against the Irish Catholic Confederation. From 1649 to 1650 he was the leading commander of the Royalist forces in the fight against the Cromwellian conquest of Ireland. In the 1650s he lived in exile in Europe with King Charles II of England. 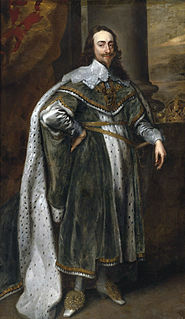 Upon the restoration of Charles to the throne in 1660, Ormonde became a major figure in English and Irish politics, holding many high government offices. Owen Roe O'Neill was a Gaelic Irish soldier and one of the most famous of the O'Neill dynasty of Ulster in Ireland. O'Neill left Ireland at a young age and spent most of his life as a mercenary in the Spanish Army serving against the Dutch in Flanders during the Eighty Years' War. Following the Irish Rebellion of 1641, O'Neill returned and took command of the Ulster Army of the Irish Confederates. He enjoyed mixed fortunes over the following years but won a decisive victory at the Battle of Benburb in 1646. Large-scale campaigns to capture Dublin and Sligo were both failures. Sir Felim Rua O'Neill of Ceann Ard (Kinard), also called Phelim Roe O'Neill or Féilim Rua Ó Néill (Irish), was an Irish nobleman who led the Irish Rebellion of 1641 in Ulster which began on 22 October 1641. He was a member of the Irish Catholic Confederation during the Wars of the Three Kingdoms, where he fought under his kinsman and second cousin, Owen Roe O'Neill. He was captured on an island in Roughan Lough near Stewartstown, County Tyrone, and executed during the Cromwellian conquest of Ireland in 1653. Confederate Ireland or the Union of the Irish was the period of Irish self-government between 1642 and 1649, during the Eleven Years' War. During this time, two-thirds of Ireland was governed by the Irish Catholic Confederation, also known as the Confederation of Kilkenny because it was based in Kilkenny. 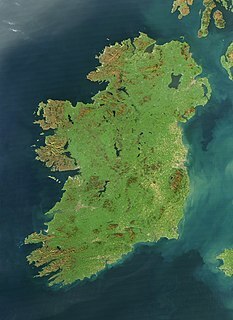 It was formed by Irish Catholic nobles, clergy and military leaders after the Irish Rebellion of 1641. The Confederation had what were effectively a parliament, an executive, and a military. It pledged allegiance to Charles I. The Battle of Julianstown was fought during the Irish Rebellion of 1641, at Julianstown near Drogheda in eastern Ireland, on 29 November 1641. The Siege of Drogheda took place on 3–11 September 1649, at the outset of the Cromwellian conquest of Ireland. The coastal town of Drogheda was held by the Irish Catholic Confederation and English Royalists under the command of Sir Arthur Aston when it was besieged by Parliamentarian forces under Oliver Cromwell. After Aston rejected an offer to surrender, the town was stormed and much of the garrison was executed and an unknown but "significant number" of civilians were killed by the Parliamentarian troops. The outcome of the siege and the extent to which civilians were targeted is a significant topic of debate among historians. The Battle of Scarrifholis was fought in County Donegal in the north-west of Ireland on 21 June 1650, during the Irish Confederate Wars – part of the Wars of the Three Kingdoms. It was fought between the Ulster Army (Catholic), commanded by Heber MacMahon, Roman Catholic Bishop of Clogher, and an English Parliamentarian army commanded by Charles Coote, 1st Earl of Mountrath and composed of troops from the New Model Army and local Ulster Protestant settlers. The battle resulted in the annihilation of the Ulster army and the loss of most of its weapons and supplies. This secured the north of Ireland for the English Parliament and contributed greatly to the Cromwellian conquest of Ireland. Plantations in 16th- and 17th-century Ireland involved the confiscation of land by the English crown and the colonisation of this land with settlers from the island of Great Britain. There had already been smaller-scale immigration to Ireland as far back as the 12th century, which had resulted in a distinct ethnicity in Ireland known as the Old English, or Hiberno-Normans. Unofficial plantations carried out privately by landlords also took place, such as those in County Antrim and County Down. Donagh [Donough] MacCarthy, 1st Earl of Clancarty, 2nd Viscount Muskerry was an Irish noble. He sat in the Irish House of Commons in the Irish Parliaments of 1634 and 1639 as member for County Cork. He married Ellen (Eleanor) Butler, who was the younger sister of James Butler, 1st Duke of Ormonde. The Earl served as a Munster general during the Irish Confederate Wars. He was one of the ten named in Act for the Settlement of Ireland 1652 as leaders of the Royalist forces in Ireland. The Sack of Wexford took place in October 1649, during the Cromwellian conquest of Ireland, when the New Model Army under Oliver Cromwell took Wexford town in south-eastern Ireland. The English Parliamentarian troops broke into the town while the commander of the garrison, David Sinnot, was trying to negotiate a surrender – massacring soldiers and civilians alike. Much of the town was burned and its harbour was destroyed. Along with the Siege of Drogheda, the sack of Wexford is still remembered in Ireland as an infamous atrocity. The city of Waterford in south eastern Ireland was besieged from 1649–50 during the Cromwellian conquest of Ireland. The town was held by Irish Confederate Catholic under General Richard Farrell and English Royalist troops under general Thomas Preston. It was besieged by English Parliamentarians under Oliver Cromwell, Michael Jones and Henry Ireton. Charles Coote, 1st Earl of Mountrath was an Anglo-Irish peer, the son of Sir Charles Coote, 1st Baronet, and Dorothea Cuffe, the former being an English veteran of the Battle of Kinsale (1601) who subsequently settled in Ireland. Presented below is a chronology of the major events of the Irish Confederate Wars from 1641-1653. This conflict is also known as the Eleven Years War. The conflict began with the Irish Rebellion of 1641 and ended with the Cromwellian conquest of Ireland (1649–53). The Battle of Dungan's Hill took place in County Meath, in eastern Ireland in August 1647. It was fought between the armies of Confederate Ireland and the English Parliament during the Wars of the Three Kingdoms. The Irish army was intercepted on a march towards Dublin and destroyed. Although it is a little-known event, even in Ireland, the battle was very bloody and had important political repercussions. The Parliamentarian victory there destroyed the Irish Confederate forces’ Leinster army and contributed to the collapse of the Confederate cause and the Cromwellian conquest of Ireland in 1649. This is a timeline of events leading up to, culminating in, and resulting from the Wars of the Three Kingdoms. The Siege of Dublin took place in 1649 during the War of the Three Kingdoms. It was a failed attempt by combined Irish Royalist and Confederate forces to capture the capital of Dublin which was held by English Republican forces under Michael Jones. It was part of a strategy by Duke of Ormonde, head of an alliance loyal to Charles II, to seize the remaining foothold of Ireland still under control of the London Parliament. Hull, Eleanor (1931). A History of Ireland . Kenyon, John & Ohlmeyer, Jane (editors). The Civil Wars, Oxford 1998. McCoy, G. A. Hayes. Irish Battles, Belfast 1990, ISBN 0-86281-250-X.